According to a MARU/Vision Critical study commissioned by Westwood One to measure brand effect and sales impact of AM/FM radio for a major breakfast brand, breakfast thinkers/planners were likely to be heavy AM/FM radio listeners. Of the one-third of Americans who plan breakfast for the week and purchase ahead of time, 48% are more likely to be heavy radio listeners than the overall population of adults 25-49. As a result of the AM/FM radio campaign, awareness for the two breakfast brand products grew 7% and 12%, respectively. Purchase behavior increased 13% for the parent brand after exposure to the AM/FM radio campaign. 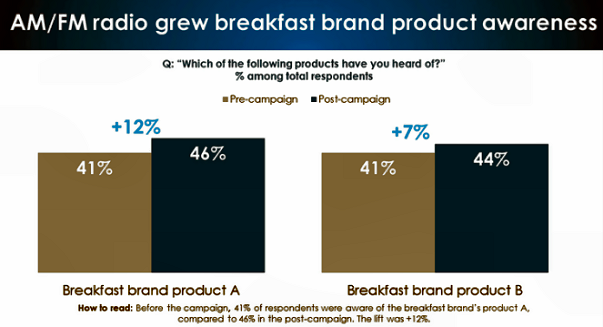 After the radio campaign period, 13% more consumers said they purchased products from the breakfast brand. AM/FM radio grew product trial and brand awareness 26%. Post AM/FM radio campaign, 26% more respondents said they were aware of the product category and actually tried it. Whether the goal is to drive purchase, tune-in or store traffic, AM/FM radio has a track record of delivering a positive return for brands. Radio's power as a medium that drives action is evident. It works for TV tune-in, retail, quick service restaurants, and, as evidenced by the breakfast brand study, consumer packaged goods. The study was conducted among 500 respondents before the campaign and 500 respondents after the AM/FM radio campaign. The results reinforced AM/FM radio's role as a powerful medium that drives action for consumer packaged goods.